The Leafs played their home opener at the NDCC Saturday night. They beat Creston Valley Thunder Cats 7 to 4 based on a dominated first period. The Leafs dominated the first half but came close to blowing their lead before securing a 7 to 4 win over the Cats. Sep. 14, 2013 3:00 p.m. The Nelson Leafs dominated the first half of their home opener but came close to blowing a lead before securing the 7 to 4 win over the Creston Valley Thunder Cats on Saturday. 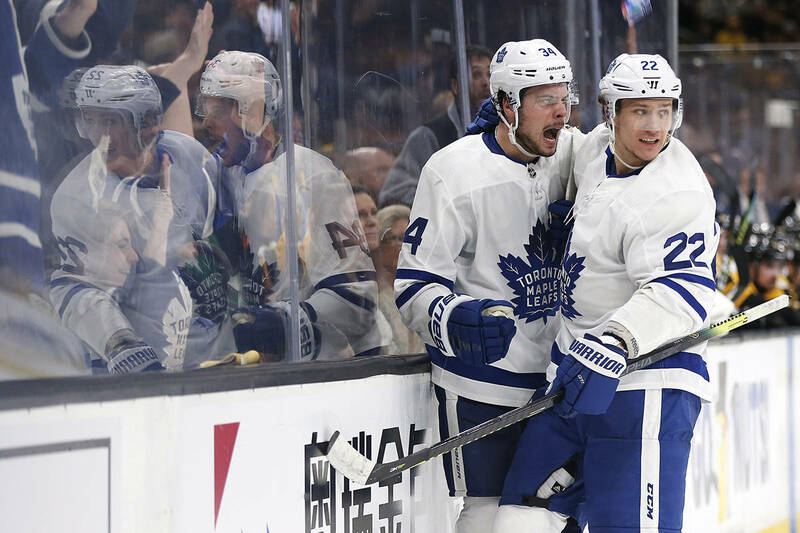 The Leafs scored six unanswered goals before the Thunder Cats got on the board. Tyler Garcia put it past the Creston net minder under a minute into the start of the first period. Matt MacDonald scored just over two minutes later to make it 2 to 0 and it was Jaimie Vlanich who got the next two with one goal scored unassisted. Garcia made it 4 to 0 to round out the first period of regular season hockey action played at the Nelson and District Community Complex this season. Carson Willans kept up the Leafs scoring streak making it 6 to 0 early in the second period. It was a power play goal. The Leafs had outshot the Thunder Cats 25 to 8 and then the Cats made their move. With 9:56 left in the second, Matthew Murray put it past Nelson starter Adam Maida. Trevor Hanna then scored with just over five minutes left in the period. And then play started to get rough. The Thunder Cats scored again with Brandon Formosa making it 6 to 3 — the score after 40 minutes play. Even though the Leafs came back strong in the third, Formosa got a goal to bring the Cats within two. It was a power play goal and the score was 6 to 4. But Aaron Dunlap got the seventh goal for the Leafs garnering them a win they hung onto claim. Shots on goal at the end of the game were 37 to 22 in favour of the Leafs. There were 380 people in attendance at the NDCC. The Leafs made their regular season debut in Castlegar against the Rebels and took home a 5 to 2 win against last year’s KIJHL champs. The team took both preseason games against the Rebels as well as they had a strong start to 2013-2014 hockey action. The Leaf’s next game will be played on Friday, September 20 at the NDCC against the Summerland Steam.